* In late-2008, because of a corporate joint venture, Sony Corporation of America operated music labels such as Arista Records, Columbia Records, Epic Records, J Records, Jive Records, RCA Records and Zomba Records. Since the Funny Lady soundtrack was previously an Arista release, it is now owned by Sony. Columbia Legacy re-released the CD in 2009 with, apparently, no changes. The Funny Lady soundtrack was released by Arista Records—not Columbia Records (Streisand’s record label and recording “home” since 1962). Clive Davis (a Columbia Records executive who encouraged Streisand to record contemporary songs on the Stoney End album) partnered with Columbia Pictures and created the Arista label. 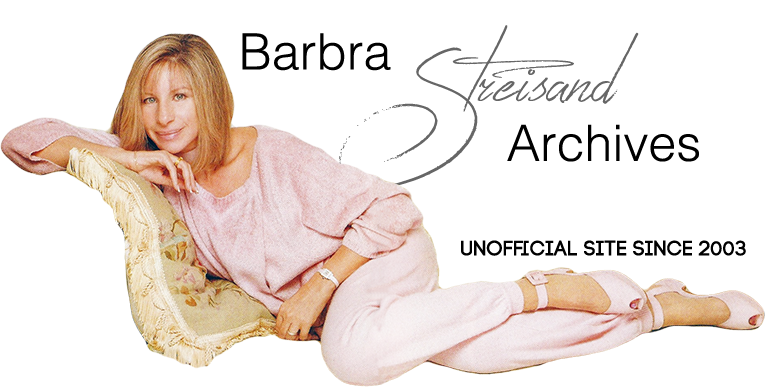 “After many discussions between me and [Streisand's] devoted manager, Marty Erlichman, he and Barbra agreed to let Arista have the album,” wrote Clive Davis in his 2013 memoir. Arista advertised the album proudly as one of the first releases from the new label. The original Funny Lady album contained 15 tracks. Curiously, the James Caan vocal of “Me and My Shadow” was included, even though it was cut from the final film. Also included on the soundtrack album was the complete track of “So Long Honey Lamb.” Again, in the final film, this number was shortened and lasted only a few seconds. Because Quadraphonic sound was a popular format, Arista also released another version of the Funny Lady soundtrack as a Quad album. (See “Funny Lady” Quadraphonic page). Arista promoted “How Lucky Can You Get” as the single from the Funny Lady soundtrack. A 45-rpm single of the song was released which contained different Streisand vocals and a different musical arrangement than the album version. Later, an Arista compilation album entitled Soundtrack Memories (ARISTA/2005) featured another version of “How Lucky Can You Get.” On this one, the first half of the song (with the male backup singers) is completely different than the album and single versions. The men’s voices are huskier and there are a few more “doo-ahh’s.” Plus, Streisand’s singing of the lyric is different as well. You can listen to it below on the Funny Lady Jukebox. The Funny Lady soundtrack first appeared on CD in 1990 on the Bay Cities label. The CD contained liner notes by Merrick S. Talcove. The CD also replicated the tracks in an order exactly like the original vinyl album. Eight years later, back on the Arista label, Funny Lady once again had another life on CD. This time, the CD reissue producer Didier C. Deutsch dug into the Arista master tapes and remastered the tracks in 20-bit digital technology. He put the tracks in the order in which they appear in the film. Deutsch included, as a bonus track, the single mix of “How Lucky Can You Get”. Another new addition to the Funny Lady soundtrack which appeared on the Arista 1998 CD reissue was the dramatic introduction before “Let’s Hear it For Me,” sung by Streisand in the film as she leaves Nick Arnstein for good. (“Well I’ll be damned. No I won’t be damned. Cause I have been damned. But I won’t be damned anymore.”) This introduction had not appeared on previous Funny Lady soundtracks. The 1998 CD features an entirely different version of “Great Day,” complete with the minor chords that Streisand sings as the song opens, as well as the complex middle-section with the clapping hands. You can listen to a comparison between the original LP version and the 1998 Arista CD version of “Great Day” by visiting the Funny Lady Jukebox below. Columbia Pictures issued a very rare 10-inch promotional record of Barbra Streisand's songs from Funny Lady. After detailing the various versions of the Funny Lady soundtracks that have been released over the years, it is interesting to note that there are some tracks which were not included on any of them! On the Columbia Pictures DVD of Funny Lady, fans can hear a mysterious instrumental cue if they click on the “Special Features” option. The background music is a 40-second instrumental version of “If I Love Again”. It’s also possible to hear a 29-second instrumental cue from the Aquacade number by clicking on the “Song Highlights” option. Were these part of the unused Funny Lady overture or intermisson music? Another “missing” track is Barbra Streisand’s ballad version of “Let’s Hear it For Me”, sung as the finale of the film. You can hear it at the Funny Lady Jukebox below. Crazy Quilt songs that appeared in the film have, to date, not appeared on any Funny Lady recording. The Crazy Quilt songs are: “Beautiful Face Have A Heart” (B. Rose, J.V. Monaco, F. Fisher), “If You Want the Rainbow, You Must Have the Rain”, and “Fifty Million Frenchmen Can’t Be Wrong” (F. Fisher).